Sample any one of the many photo sharing websites on the internet and it is likely that you will find that the landscape category is by far the largest. Landscape subjects it would seem are more popular with photographers than portraits, architecture, still life, fashion, glamour, children, even pets. Why is it so? We know that many of the most memorable landscapes were often recorded in the remotest areas, in the harshest of conditions at the most miserable times of day and night. Some images required the photographer to endure long walks or wait for hours for the right conditions to converge. In extreme cases, multiple attempts were needed to ensure that subject, light and composition were in perfect harmony. Yet, despite these challenges, landscape photography seems to be more popular now than ever. One response to this popularity has been a proliferation of on-line national and international landscape photography competitions. Some have even attracted the attention of the traditional print and news media. It makes great commercial sense of course that a large group of like minded people can be singled out from a complex and competitive marketplace in return for a relatively small financial cost, especially if a fee is required to participate. This is a product marketers dream. From the photographers’ perspective, the rewards of cash, gadgets and publicity are very tempting. In the more prestigious events, the outright winning photographer even runs the risk of becoming famous. This potentially mutually beneficial relationship elevates awareness to a level such that some events are now attracting in excess of 100,000 entries. Now, if only 1% is truly worthy of consideration for one of the top slots, it requires little arithmetic knowledge to calculate that in most cases, the odds of winning remain very small indeed. Yet thousands of us continue to engage in landscape photography and associated competitions with seemingly unlimited optimistic vigour. In my own case, I was moved, quite literally, by unique circumstances. I had been working in the USA for a number of years running large manufacturing companies. Weeks after being recruited to head up the operations of a large processed foods business, one of the company’s manufacturing plants exploded. There were 14 fatalities. My role as a key government witness came at a huge financial and professional cost. After excruciatingly protracted negotiations, I left behind a lucrative career in Texas and returned to Scotland in mid 2009. Instead of skyscrapers, sub tropical skies and treetop fast food signs, from my kitchen window I now had views of two castles, the Wallace National Monument and the hills of The Trossachs. My interest in recording this uniquely rich, visual feast was unexpectedly rekindled. However, during those self absorbing years of career climbing, the world of photography had moved on. Imaging technology had been transformed by the digital revolution. To my surprise, a darkroom was now called a Lightroom. And much of the community seemed to be engaged in perpetual arguments about unfamiliar topics such as noise gain, not film grain. I realised I had some catching up to do. Three Canon film bodies and a useful suite of FD lenses, all made during the Thatcher years were dispatched to a vintage collector on eBay whose name contained only vowels. By 2010 they were replaced by several 5D Mark II bodies and a bag full of L series prime lenses. Initially, few of the buttons on the camera made any sense but it was obvious that the clever engineers in Japan had been very creative. The level of functional complexity they had managed to cram into a body not much bigger than my old film models was quite remarkable. Consumer electronics is a highly competitive industry and is frequently driven by breakthrough technology, even if it’s not always strictly necessary. Sales and marketing departments need banner headlines to help shift units so product developers are driven to invent groundbreaking features and benefits. As consumers, we have to share some of the responsibility for this. The consumer market is highly fickle and entire brands have disappeared without trace due to changes in fashions and tastes. Betamax, Sony’s home video recording system is a classic example. Hard to believe now, but Apple Inc whose sales were decimated after the global acceptance of the Windows operating system, almost went bankrupt. Polaroid and Agfa are two more famous casualties as a consequence of new photographic technologies making their traditional business models obsolete. This competitive threat then compounds the desire to continue the search for the next great technical breakthrough. However, we should not get too carried away with the idea of technology taking care of all our thought processes because by doing so, we might lose sight of some basic but fundamentally important rules. Autofocus, program modes and image stabilisation for example are all useful. But digital camera technology is so sophisticated that it is easily possible that many photographers no longer fully appreciate the basics. Some cameras have more computing power than the first US lunar-lander module but to achieve a correct exposure they still rely on the linear relationship between lens aperture, shutter speed and light sensitivity (ISO). That relationship has remained virtually unchanged since the dawn of photography, over 185 years ago. And all of them still use a “middle grey” reference to establish a mid-point between pure white and black to help achieve a neutrally balanced exposure. While there remains an argument that it should be referred to 18% grey or 13% grey, this is academic. The point is that this reference standard was conceived as far back as 1903. Yet despite this pedigree, some imaging sensors still get the exposure wrong. You shouldn’t be surprised. If you are an evolutionist then you will believe that mankind has been several million years in the making. And while massive scientific progress has been made, even the best robots are barely capable of serving a decent cup of tea, all the while tethered to a laboratory by an umbilical cord with the girth of a lamp post. I am comforted by the thought that much of human intelligence remains for the foreseeable future, out of bounds to even the most powerful and sophisticated artificial intelligence machines. Soon after purchasing my digital cameras I threw away the instruction manuals and decided to switch off as much of the camera’s functionality as possible, effectively using the digital bodies in manual. Shooting entirely in RAW, colour saturation was deliberately suppressed as was sharpness and contrast. All I wanted was as much unadulterated data as the sensor was able to acquire so I could make as many decisions for myself. It was the best analogy to a negative I could achieve. Readers might conclude at this point that a lot of money was wasted on redundant technology. Point taken but my primary motive was to acquire the largest digital sensor I could afford since that would allow the greatest level of detail to be recorded and allow the production of larger prints. I learned to really like large prints when I crossed paths with a famous landscape photographer when I lived in Las Vegas, Nevada. He was making millions of dollars selling prints the size of living room walls. After buying two of them, I knew that I had just helped him part finance a new Ferrari. If that’s not motivating, I don’t know what is. The secondary reasoning was to slow down my workflow. Yes, that’s right, slow it down. Landscape photography is in one sense a forgiving genre. Compared to shooting weddings, portraits, sports and pets for example it is for me anyway, a relaxing, considerate exercise during which one has broad creative freedom to experiment with the entire range provided by the lens, shutter, ISO relationship. Sports photography typically demands high shutter speeds. Portrait work typically involves the use of a narrow range of short and medium telephoto lenses. And you have to get those wedding shots right, first time, every time. Landscape photography then is accessible. The subject matter is all around us. It offers us the chance to be as creative as our imaginations permit and it suffers from few of the restrictions of other genre such as those described previously. In the early days, most of my work was largely random, taken during chance opportunities. The productivity and success rates were low. Now, not a single image is made without some degree of forecasting, insight and planning. At the front end it is indeed time consuming but the success rate and productivity rate are now much higher. When a sports photographer attends a football match, he or she is going to get plenty of opportunities regardless of who wins the match. 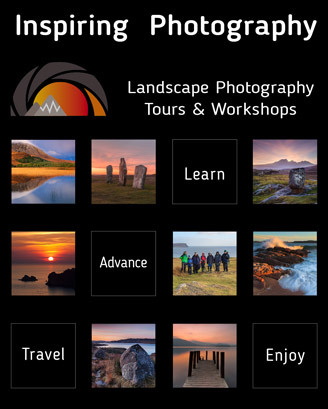 The landscape photographer has to contend with many more unpredictable variables such as seasons, climate and weather. Good research then should be part of every good landscape photographer’s workflow. I make frequent use of meteorological forecasts, tide timetables, maps and even lunar charts. Inevitably one is likely to find oneself at a location that has been photographed many times before and since. In this ever shrinking world, it is getting harder to find locations that have not already been thoroughly studied or followed up by tick list enthusiasts. So I try very hard to seek out fresh viewpoints while mostly avoiding the more popular locations. Sample any of the photo sharing websites and you will probably find large communities of photographers trying to outdo each other using exactly the same subject matter. You’ll know which locations I’m talking about; Buachaille Etive Mòr, The Cuillins from Elgol, Durdle Door, Corfe Castle and probably the most overdone of them all, Lochan na h-Achlaise. This phenomenon is understandable if not entirely agreeable. The last location which remains quite stunning by the way, is accessible by opening the car door and walking no more than 15 yards onto some rough heather. I should know. I’ve been there. However, in my twenties when I climbed in Glencoe almost every weekend it was rare to see a single car parked anywhere along the side of this little loch. What a difference two decades, the internet and cheap digital cameras have made. Almost every weekend, virtual world clubs meet in the real world to queue up for daylight. And before the weekend is over, much of this repetitive, wide angle commodity stuff is already on line. Me? I rarely shoot landscapes using wide angle lenses because I find the image reducing effect and distortion unnatural but one cannot deny the impressive shots that grace many of the covers of photography magazines using ultra wide angle glass, even if they do look over processed. This is also understandable. Shelf space is another competitive space where titles fight for attention. And colour sells. So the current trend for pimped out images will continue for some time. This consumer seduction is regrettable. Instead, I’ve been seduced by the ability, aided by software developers, to stitch together multiple images & create sweeping panoramas with breathtaking levels of detail. And there’s the conundrum. Even as I suggest we occasionally need to calibrate ourselves by taking due notice of the basics of photography, technology creates new, exciting ways of recording landscapes. Yes, the digital revolution has democratised photography and diminished somewhat its artistic and thus, financial value. And the internet has provided a vehicle for sharing information and knowledge like nothing before. But I remain optimistic that some of the current trends are just that; trends. In due course, we as consumers may moderate our tastes and discover new ways to record our ever changing landscape environment. I look forward to that. So whatever your tastes are, I urge you to go on and make a scene! 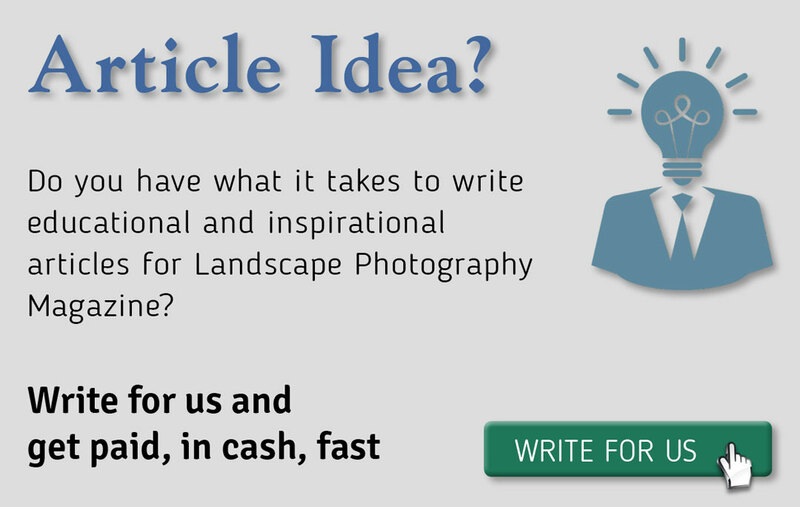 Read this and many more articles in High Definition inside Issue 5 of Landscape Photography Magazine.